The powerful WGen3600DF engineered by Westinghouse is a portable generator to provide you with dependable power when you need it the most. With its dual fuel capability, this generator gives you the option of running on either gasoline or propane. It produces 4,650 peak watts and 3,600 running watts when utilizing gasoline and 4,180 peak watts and 3,240 running watts when utilizing propane (LPG). The WGen3600DF features remote start with key fob and Push-Button start, with recoil start in case of emergency. Built with a 212cc Westinghouse OHV Engine, the WGen3600DF can run for up to 18 hours on a 4 Gal. (15 L) gasoline fuel tank. A built-in extendable handle and rugged never-flat wheels make transporting the WGen3600DF easy. The WGen3600DF portable generator is backed by a 3-year limited warranty and Westinghouse's lifetime technical support. The Generac GP8000E is ideal for home use, camping, job sites and outdoor events. With a 7.5 gal. fuel tank, this portable generator can be continuously run for up to 12 hours. The low-tone muffler helps ensure quiet operation and the fuel gauge shows you when refuelling is needed. Covered circuit breaker protected outlets provide added protection from the environment and rugged working conditions. This generator has electric start with recoil backup, battery included, and a 420cc engine that runs on gasoline. The GP8000E has four 120-Volt 5-20R outlets and one 120/240-Volt L14-30R twist-lock outlet are circuit-breaker protected. 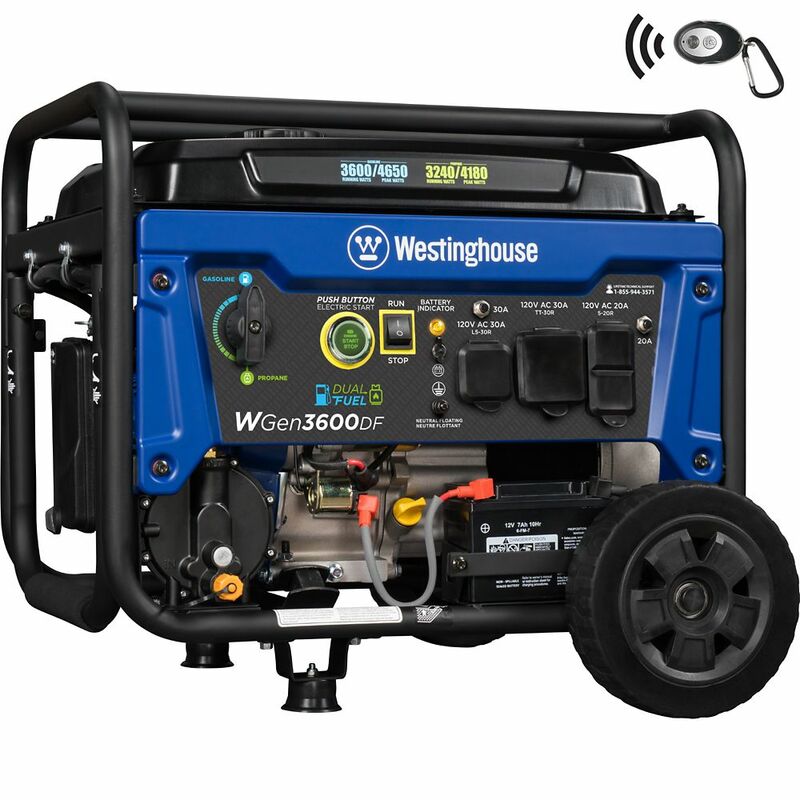 WGen3600DF Dual Fuel Portable Generator The powerful WGen3600DF engineered by Westinghouse is a portable generator to provide you with dependable power when you need it the most. With its dual fuel capability, this generator gives you the option of running on either gasoline or propane. It produces 4,650 peak watts and 3,600 running watts when utilizing gasoline and 4,180 peak watts and 3,240 running watts when utilizing propane (LPG). The WGen3600DF features remote start with key fob and Push-Button start, with recoil start in case of emergency. Built with a 212cc Westinghouse OHV Engine, the WGen3600DF can run for up to 18 hours on a 4 Gal. (15 L) gasoline fuel tank. A built-in extendable handle and rugged never-flat wheels make transporting the WGen3600DF easy. WGen3600DF Dual Fuel Portable Generator is rated 4.5 out of 5 by 255. Rated 5 out of 5 by Mrmar from Easy to start! Super simple directions with very easy instructions. Rated 5 out of 5 by Spin626 from Cranks on the 1st pull pretty quiet running. Just used today to charge trailer battery.Everything working great ! Great Buy!! Rated 5 out of 5 by Tfreeman87 from Great equipment This was a gift and I love it! Would tell anyone they need one! Rated 5 out of 5 by whitneyontheroad from Easy Setup and worked first start Got the generator home. Follow setup instructions (Maybe should have added the removal of shipping brackets tot he instructions). Filled it up and hit the remote. Started first try. Ran it off gas and propane. Runs both AC and Microwave in the trailer no problem. Rated 4 out of 5 by sary1999 from Good Generator Duel Portable Generator that use both propane and gasoline, give enough power to support a small home for any power emergency.